Wouldn't you love to peek inside Frida Kahlo's personal photo album? To see the images that have special meaning for the artist, images that paint a picture that varies greatly from the tortured individual portrayed in her paintings? 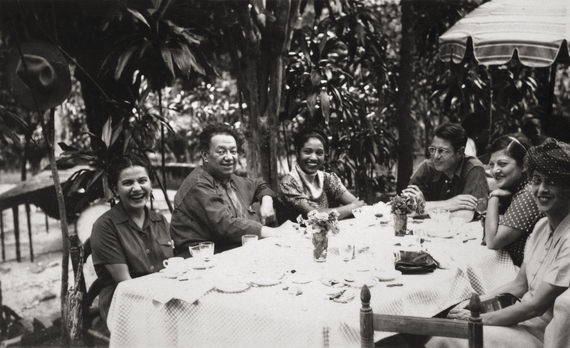 "Frida Kahlo, Her Photos," given its only West Coast showing at the Museum of Latin American Art, features over 200 images from her personal archive at Casa Azul, images that Diego Rivera sealed from public view for 50 years after her death in 1954. The exhibition shows a vulnerable, unguarded Frida, a smiling Frida, be it at work, at play, growing up or at the end of her life. The exhibition includes photographs by Lola and Manuel Alvarez Bravo, Man Ray, Tina Modotti and Edward Weston. The installation is spectacular. The wall colors are as playful as her paintings and the walls are sculpted to create a flowing, see-through space that best presents the exhibition's six themes: "Her Parents: Guillermo and Matilde," "La Casa Azul," "The Broken Body,' "Amores," "Photography," and "Diego's Gaze." A lot of the early photographs were taken by her father. This makes sense: he was a professional photographer. It's easy to see where she got her penchant for self-portraits. The images show a pre-polio and tramcar accident Frida as a lovely child, an adolescent and a young woman. One sequence looks like a series of yearbook photos: Most Likely to Set 20th Century Art on its Head. Some of the images show indigenous peoples, some show the Mexican landscape. Intriguingly, there's a trio of images that depict, individually, Lenin, Trotsky and Stalin. Wouldn't you die to know the significance of that? For that matter, wouldn't you like to know specifically why she held onto each of the images on display? Surely they all had a story. The most heroic images show her in the hospital after her accident. She lays on her bed, in traction. She has managed to install a horizontal easel that lets her paint, miraculously, with the canvas suspended above her. Other images show her lying on her stomach, the scar on her lower back a grim reminder of her operation. You know the particulars of her accident but the documentation of the surgery's aftermath provides a whole other level of appreciation for what she had to endure and what she managed to accomplish. Some of the images are funny. A series of photographs show family scenes or else get togethers with friends. What makes them funny is that, God knows why, she's cut herself out the image, a bit of self-editing that is as funny as it is intriguing. One in particular is outright cute: she's kissed a photo of Diego, her lipstick a reminder of more affectionate times. The most remarkable image of all shows Frida sitting in a chair. The actual image is small but the Museum has blown it up so it dominates a wall. She looks severe. Not only is her hair down (you never see that), but she's also wearing a dark, unexceptional dress, nothing at all like the colorful clothes and jewelry with which we associate her. It's a stark image, a mesmerizing one. It shows a woman looking tough and determined, broken but not down. This exhibition of Frida's Fridas presents another side of a woman whose backstory, as shown here, is as fascinating as her paintings. The exhibition reminds us that, besides being married to Diego Rivera (twice, in fact), she was also a daughter, a sister, a relative, a friend, a patient and a lover. We marvel - and will continue to marvel - at how she managed to sublimate challenges physical and emotional into her art, which in turn continues to inspire those with similar challenges. The impression that comes from this show is of Frida Kahlo as a constant gardener, making things blossom out of the most unlikely soil. The exhibition runs until June 8. Museum hours are 11am - 5pm, Wednesday, Thursday and Saturday and 11am - 9pm, Friday. Admission is $9 general, $6 students and seniors. Sundays are free. The Museum is located at 628 Alamitos Avenue, Long Beach, CA 90802. For more information, call (562) 437-1689 or visit www.molaa.org.